Raging Spirits is a roller coaster (or "jet coaster" as they're called in Japan), taking you over and around the excavation site of ancient ceremonial ruins. This coaster's main feature is a 360-degree loop. Raging Spirits looks beautiful, particularly at night. 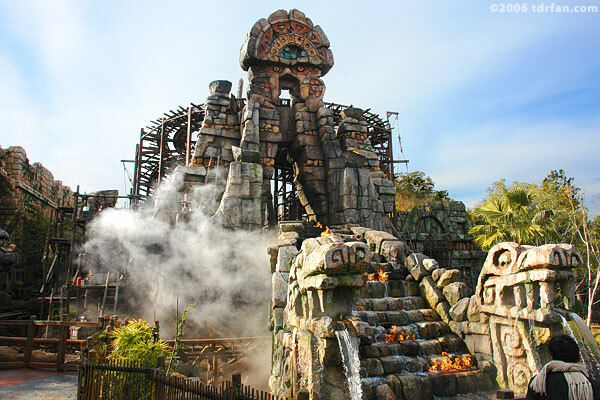 The front of the attraction has a stair-step waterfall, with tongues of fire rising from the water. When a train passes through the final curve billows of smoke rise up, obscuring the riders' view and making the scene even more mysterious for the onlookers. Although the attraction looks beautiful, I will have to say frankly that this is one of the most un-fun coasters I've ever been on. A big problem is the restraint system. Coaster aficionados may be familiar with the "U" bar that lowers over your head (the first time I encountered one of these was on the old Corkscrew at Knott's Berry Farm). This particular version seems to be overbuilt; it presses down hard on your chest, and the thick U leaves little room for your head to move around. For me it's not only uncomfortable, it's painful, as you get bumped around taking a lot of the impact with your shoulders and chest. Unless you hold your head very still your head gets bumped side to side as well. Even if you disregard the restraint system, the ride isn't that fun. It seems that there was only a limited amount of space to put this attraction, and as coasters go this one is short and bland. As previously mentioned, the highlight is a 360-degree loop; the loop is very tight and you will definitely feel the g-forces as you go through it. Unlike other Disney thrill rides, there are no real special effects on this one, other than some smoke at the end of the ride. Only the most diehard coaster fans should consider riding this attraction. For everyone else, looking at it from the outside should be enough. If you're not going to ride and you still want to see the loop, you can walk around to the left side of the attraction where you'll find an observation area with a nice view.